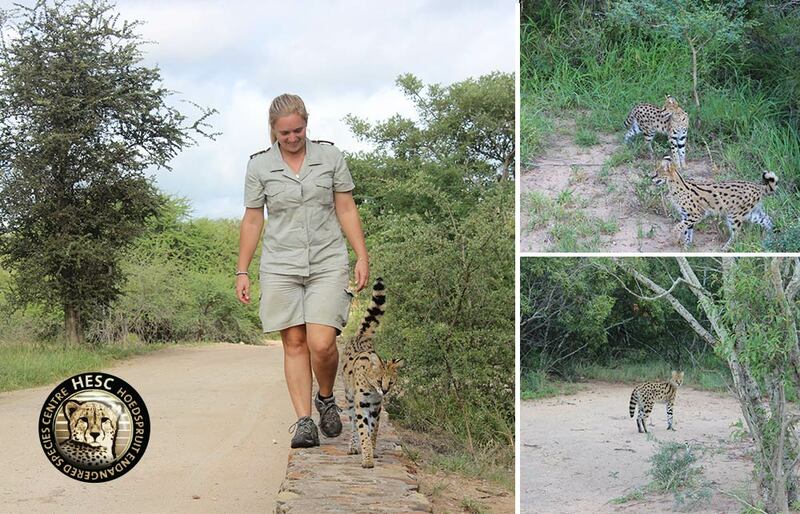 During March 2017, three serval cats that were confiscated by Nature Conservation were brought to the Hoedspruit Endangered Species Centre (HESC) to be raised. The plan with the cats was always to release them back into the wild. Life, unfortunately, had other plans and of the three servals, one did not survive. The two brothers, however, have been doing marvellously. They have been growing big and strong! The plan to release them onto the Kapama reserve on which Camp Jabulani is located, was decided upon towards the end of last year. The servals were moved, by Linri (Head Curator at HESC) into a holding enclosure on 29 January, in order for them to grow accustomed to their surroundings. Once settled, Camp Jabulani’s manager Chantel was responsible for looking after them. It was time to open the doors of the enclosure and let them out onto the reserve. Everyone was astounded and happy when seeing the two head into the bush. They were followed and watched for about half an hour to see how they would react to the natural surroundings and it is safe to say that they were perfectly at home. HESC will continue to monitor them and ensure they are doing well in the wild. Keep your eyes on our blog to follow their story! congratulations to you all for the wonderful work you are doing and for the successful release of the servals and the hyena. look forward to hearing how they are coping in the wild.